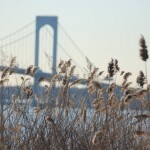 Bronx Council for Environmental Quality » Blog Archive » Phragmites over New York. Great photo — love what you’ve done with foregrounding the plants! Lovely–I especially love the contrast between the soft but in focus plants and the hard but out of focus bridge! Lovely juxtaposition of nature and a man-made structure. Great Shot. The compostion is perfect !! I think I like “Phragmites over New York” best of the set. Fantastic composition, particularly appreciate the softness of the nature against the bridge. Well done. Which bridge is that? It looks like the GW, but it can not be if it were taken by Pugsley Creek. Kind of like nature is about to reclaim the city! I love this one – Man and Nature in harmony! A beautiful photo! What a great foreground/background contrast of focus. I really like this one — both the composition and the juxtapositioning of subjects. Phragmites is an alien invasive. Let’s emphasize native wetland plants and their habitats. I can’t believe I’m going to say this but I agree with IC- we don’t want to promote phragmites or make it seem beautiful. But isn’t this a photo contest? Not a battle against invasive competition. Love th pic! Well, I think we can use the photo and explain exactly what the problem is with phragmites and what lesson there is to be learned. I would not mind including this excellent photo of a wetland juxtaposed against man’s infrasturucture, but I would suggest a caption caveat that educates the viewer as to why. beautiful as they may be (think Anoplophora glabripennis), non-natives are harmful to Bronx ecosystems. I love all the comments on this one, and the controversy. When I took this photo it was to emphasize our struggle against invasive plants and the misleading beauty they can portray. I spend my days battling the rampage of the invasives, in my job as a Forestry Technician, at one of our city’s major parks. So I’m in no way trying to promote them. More trying to promote discussion. Glad it works. Martin, thank you for the comment. Would you like to write up something as we decided to use nice photos as yours to explain environmental problems. We will be doing it for the fireworks photo, as well.